Right – forget all the superlatives that I've been using about all those other Polynesian Islands! We have 100%, definitively found Paradise here in Aitutaki, in the Cook Islands. This is an absolutely stunning island. What makes this place paradise? 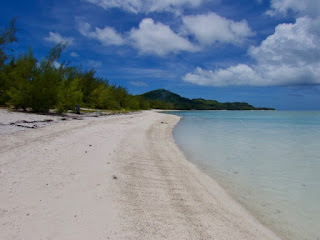 Could it be the most incredibly beautiful lagoon I've ever seen? So many colours that it took your breath away, while the inviting waters were as warm as a bath. 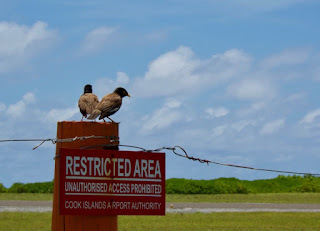 The atmosphere of the whole island is so laid-back – the friendly locals constantly shout "kia oranas" (hellos) to you as you pass. What's on the land was beautiful too – its low hills covered in lush forests and grass land. And to think that we almost didn't get in here to paradise. 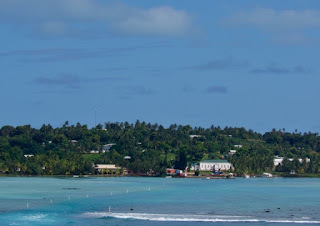 Ships have to anchor outside the lagoon, and the swells meant that the tender was bouncing around – so much, that the Captain very nearly cancelled our call, before thankfully the waves died down enough to let us in. 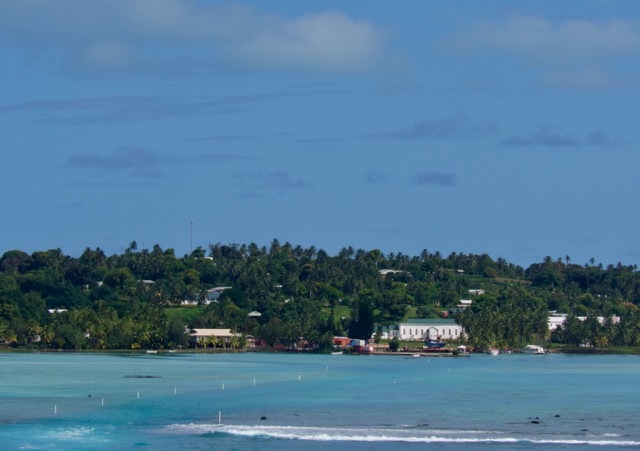 Only 2,000 people live on the island, so there's not much to see in the friendly little capital, Arutanga itself. 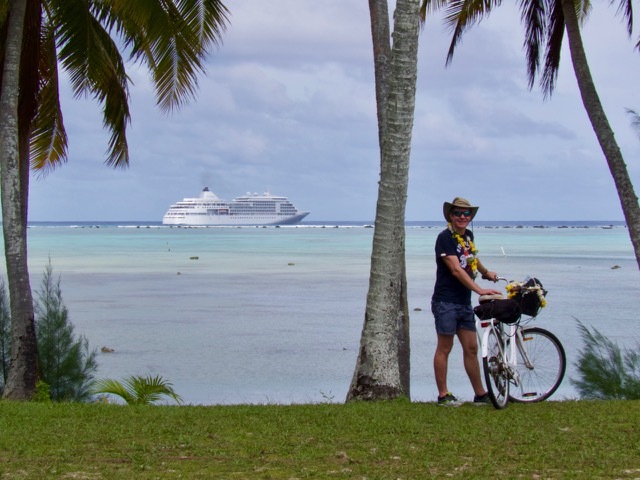 So we hired a couple of bikes and did a full circuit around the island – we did about 20kms in total, but the roads were flat and fairly smooth, and most of the gears on our old bikes actually worked. 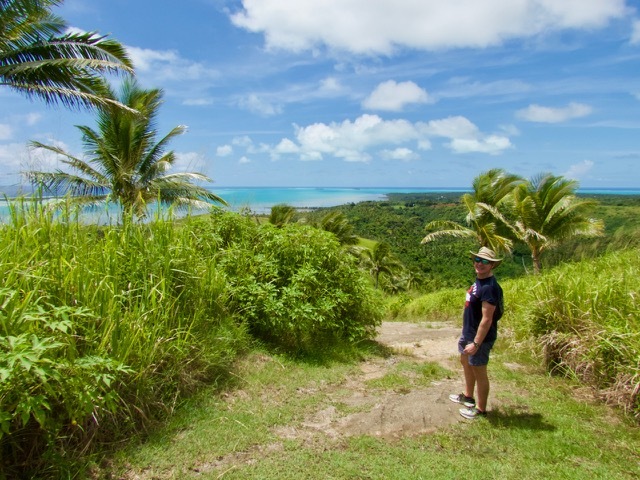 Every view we got along the way was wonderful, but for the very best views on the island we climbed the steep paths up to the top of the 124 metre high Mount Maungapu – where we were treated to some unbelievable 360 degree views across the whole island and its incredible lagoon. If we weren't already panting from the climb, our breath would have been taken away by the superb panorama. We decided not to snorkel on the oceanside beaches, and instead headed to the stunning O'otu Beach looking across to the lagoonside islands, where we set up camp in an idyllic beach bar for a swim and lunch. 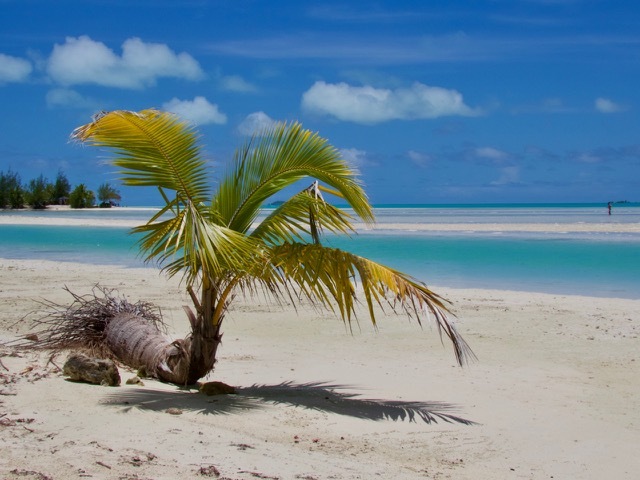 It was another surreally beautiful setting of white sands, swaying palms, turquoise waters and scarcely another tourist in sight (apart from a few luxuriating cruise passengers). 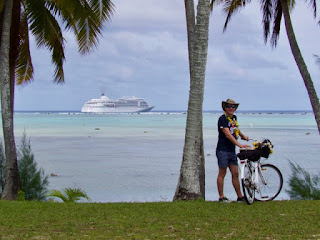 Having found paradise, it was tempting to stow away here and never leave, but we got back on our bikes and continued our tour de Aitutaki, just getting back to Arutanga as the heavens opened and it absolutely bucketed down. I suppose this drenching was a reminder that there's no such thing as paradise. But, I think we got pretty close!